Amir Ganor is not your usual archaeologist. Although he works for the Israel Antiquities Authority he packs a handgun because his primary responsibility is apprehending thieves who plunder sites for valuable artifacts to sell on the antiquities market. In this case a group of Palestinians were breaking into the complex of tunnels and caves in the Judean Coastal Plain or shefela in the area of Beit Guvrin, specifically Hirbet Midras, looking for coins and other treasure. This led Ganor to the site where a large stone lintel was uncovered. The same lintel was first uncovered in the 1980s and based on the expert opinion of Prof. Amos Kloner was thought to be from a synagogue since it was almost identical to one found in the north at Hirbet Nevoraya. Ganor requested approval and support from the Antiquities Authority to excavate the area to discover more about the public building. Within a short time very impressive and beautiful floor mosaics were uncovered. Large dressed stones with what look like Byzantine crosses were discovered when the plaster covering them fell off. Combined with the architectural details, an apse, a crypt, mosaic floors, it seems that the building was a church. The church was destroyed by an earthquake some 1,300 years ago and lay mostly covered until the 19th century. The columns and capitals are displayed exactly as they were found, lying parallel on the ground and the northern wall is angled out from the movement of the earthquake. There are several construction phases, in the last two the building was used as a splendid church. 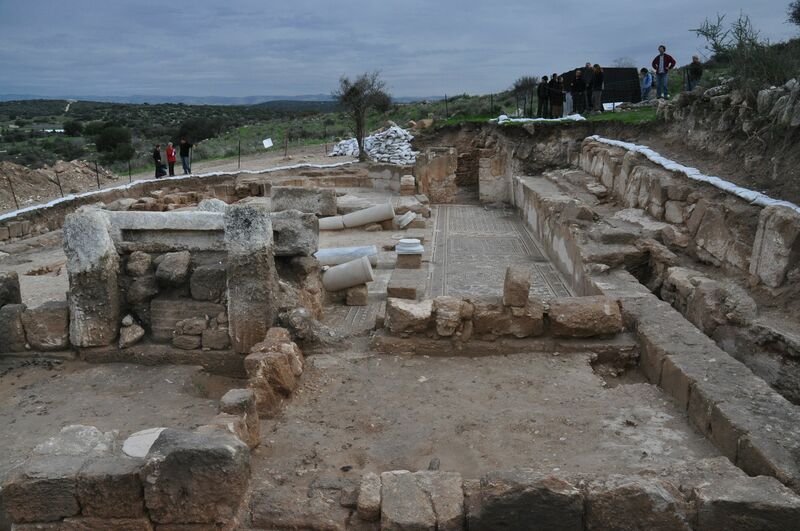 However, in the first phase the excavation shows that the later church was built inside a large public compound from the Second Temple period. The church, in its last phases, was built as a basilica, a central nave and two wide aisles that are delineated by eight marble columns with magnificent capitals which were specially imported (the eight bases can be seen but only 3 capitals and columns remain). The front of the church had a large flagstone courtyard, a narthex, and at the end of the nave is a raised bema or platform (that was added later – you can see that the mosaic floor continues under the bema). Located behind the bema are two rooms, one paved with a marble floor and the other that led to an underground tomb that was empty. Beneath the entire building is a subterranean complex in which there are rooms, water installations, traps and store rooms for hiding. 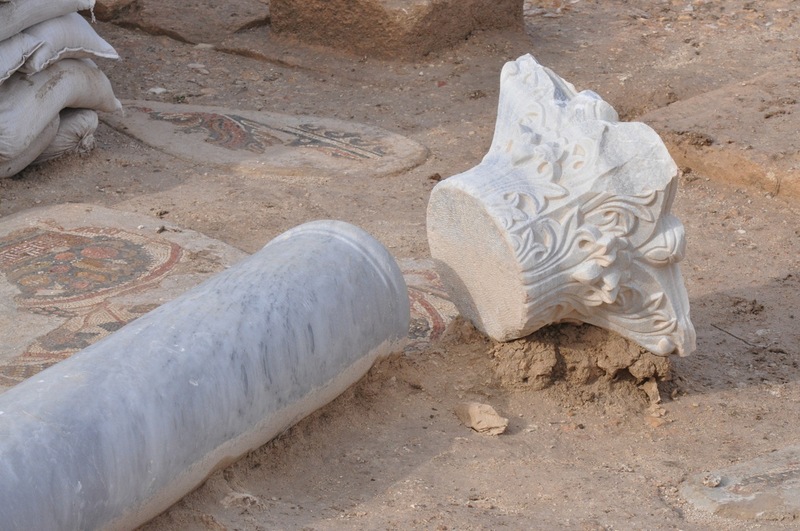 Among the artifacts discovered are coins from the time of the Great Revolt (66-70 CE) and the Bar Kokhba uprising (132-135 CE), stone vessels, lamps and various pottery vessels that are characteristic of the Jewish population from the settlement at that time. 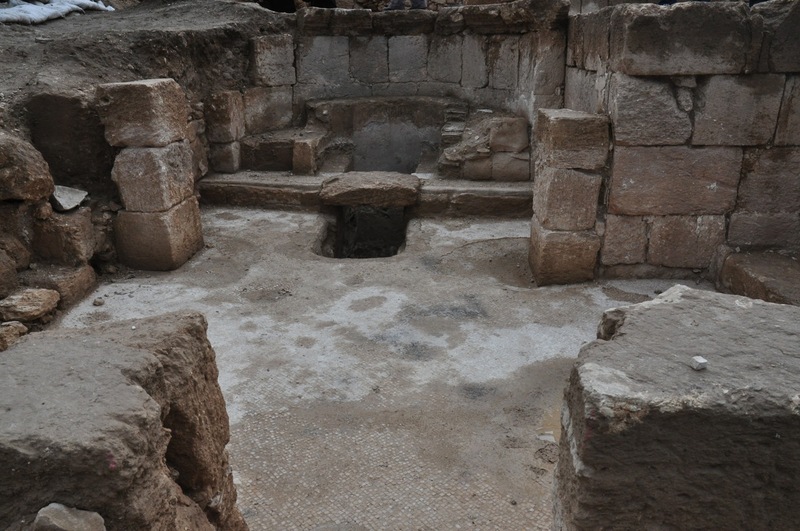 Scholars who visited the site during the excavation proposed identifying the crypt as the tomb of the prophet Zechariah. 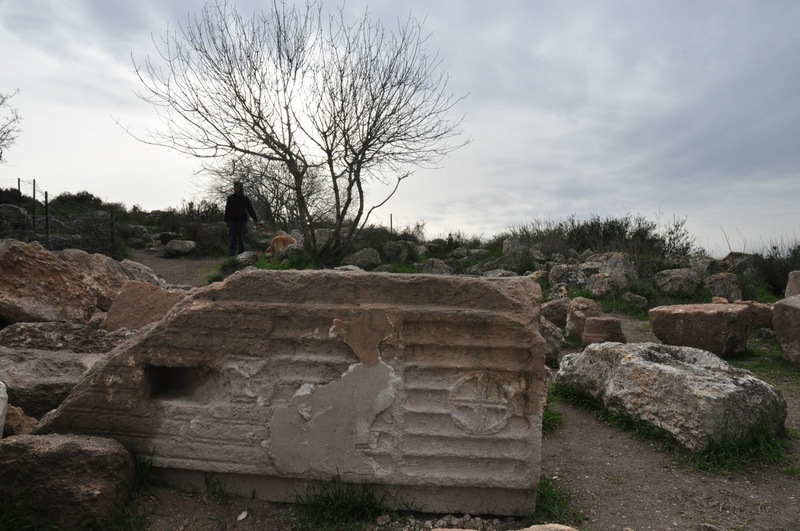 Early Christian sources identified his burial place in the village of Zechariah which was discovered in 415CE. 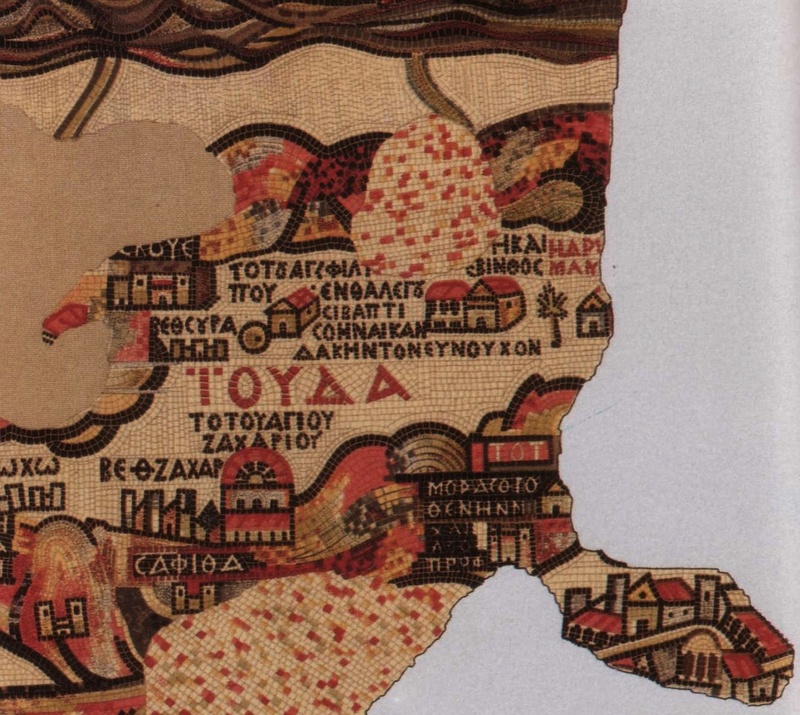 In light of these sources, including the Madaba Map (the building with the apse with the Greek, ΒΕθΖΑΧΑΡ to its left is Bet Zechariah), scholars think the church at Hirbet Midras is a memorial church meant to mark the tomb of the prophet Zechariah. 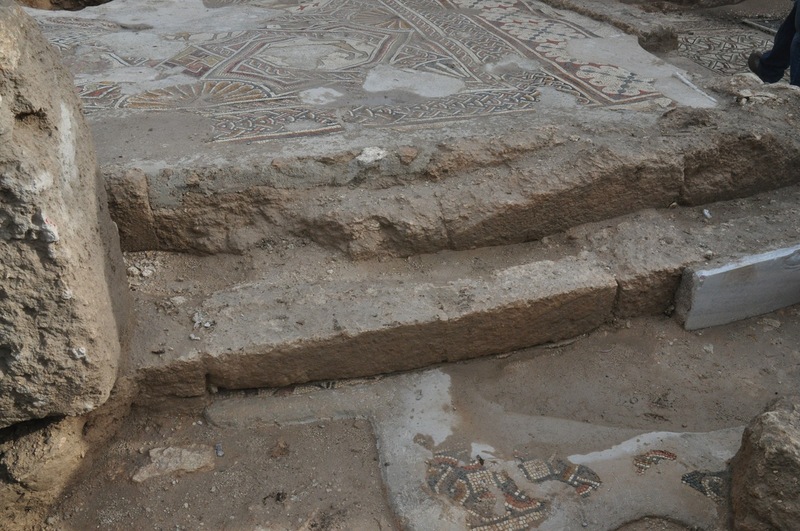 This entry was posted in Archaeology, Architecture, Art and tagged Byzantine, church, earthquake, Khirbet Midras, mosaic, mosaic floor, photographs, photos, postaweek2011 on February 4, 2011 by Shmuel Browns.